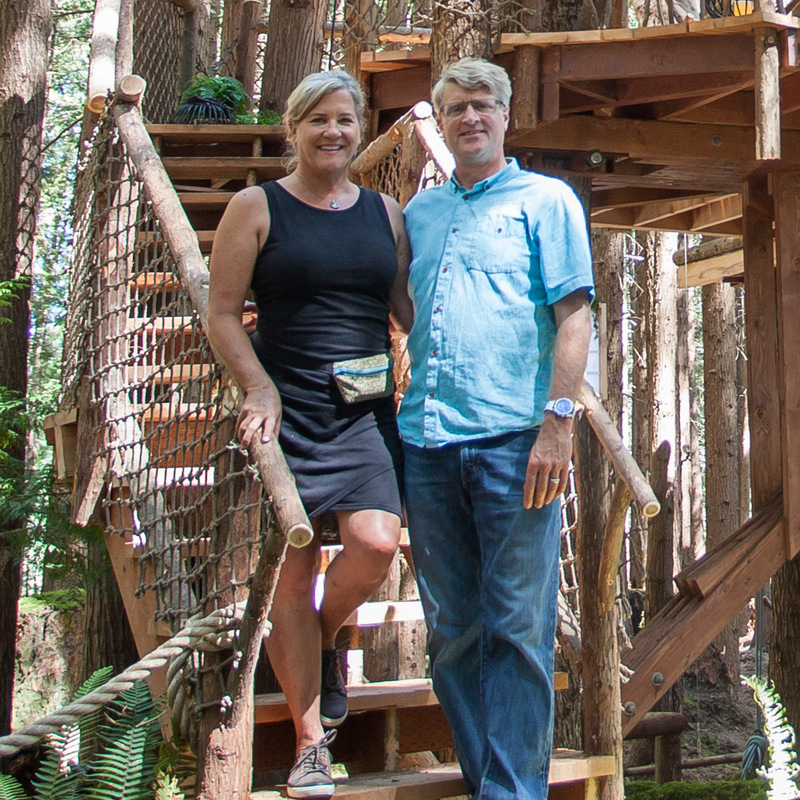 Your source for all things Nelson Treehouse - information and updates on Pete Nelson, the Treehouse Masters, TreeHouse Point, and Nelson Treehouse and Supply. Looking for the perfect gift for the treehouse aficionado in your life? We've got you covered with this handy guide to our favorite treehouse gifts under $50. Most of these products were designed in-house at our treehouse HQ and made in the USA. They’re the perfect way to give a bit of the #treehouselife this holiday season! Pete Nelson’s 2019 Treehouse Calendar is full of stunning images of treehouses from around the world. This year's cover star is the regal Chapelle at Treehouse Utopia. Each month features a legendary treehouse with a full-page photo of the exterior and a secondary photo of the interior. Ample weekly boxes leave you plenty of space to write in your life. This 500-piece jigsaw puzzle features the iconic Temple of the Blue Moon at TreeHouse Point. We also have a second puzzle, featuring the Silver Maple Treehouse. Why it makes a great gift: This vibrant and challenging puzzle enthralls puzzlers of all ages while providing a healthy dose of treehouse escapism. 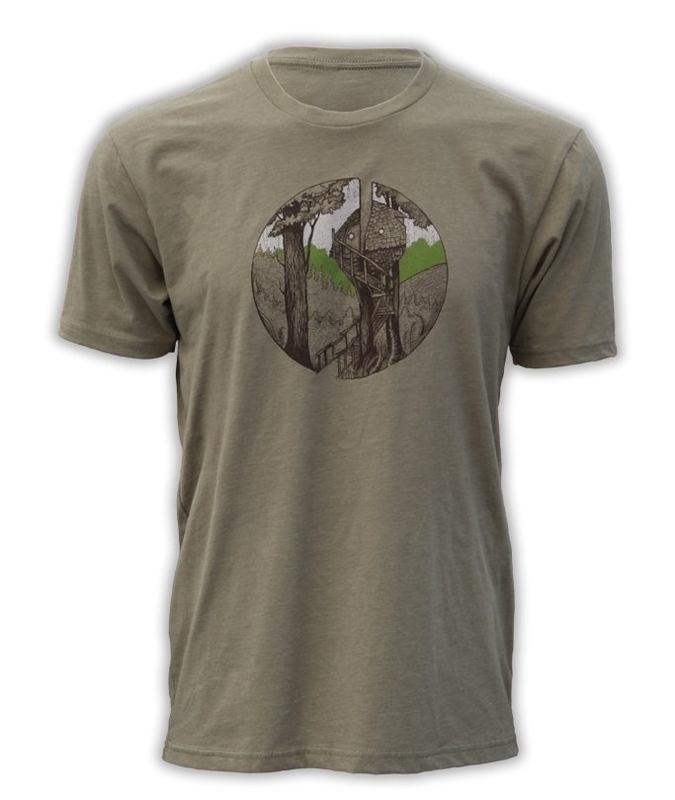 Why it makes a great gift: No matter what you do, this shirt will help you breeze through your day with a mellow treehouse mindset, thanks to its reminder to "Be in a Tree." Building a treehouse? You need this guidebook in your life. Treehousing: The Instructional Guide contains foundational information on treehouse design and build: from selecting and evaluating trees, to designing your platform, to installing specialized treehouse hardware, to applying for a permit. Its pages cover best practices that Pete Nelson and his crew have developed from over 30 years of treehouse-building. Consider it requisite reading before taking to the trees. Why it makes a great gift: We revamped our first edition of Treehousing, adding up-to-date techniques and new figures. This is Treehousing 2.0: an essential part of every treehouse-builder’s toolkit. Inspired by the adventurous spirit of the treehouse life, we bring you a trusty and intrepid enamel mug. This mug’s got it all: it features a hand-drawn design (made in-house at our treehouse HQ), it’s dishwasher and freezer-safe, oven-safe up to 520 degrees F, rust-resistant, and perfectly suited to campfire-cooking. This T-shirt features original artwork of our Beehive treehouse by the wickedly talented artist/climber/filmmaker/activist Jeremy Collins. With its organic curves and honeycomb-shaped windows, the Beehive is one of our all-time favorite treehouses. Jeremy’s intricate illustrative art beautifully captures the Beehive’s striking intimacy with nature. Why it makes a great gift: Like all our apparel, these shirts are printed by the nonprofit Sanctuary Screenprinting in Seattle. Durable yet soft poly-cotton blend makes for an ultra comfy shirt-wearing experience. You just might never take it off. Channel your inner Pete Nelson with this coloring book. Filled with 14 of Pete's hand-drawn treehouse designs, its compact size makes it perfect for doodling in planes, trains, and automobiles. Why it makes a great gift: Treehouse enthusiasts of all ages will find coloring Pete's designs a fun, creative, and relaxing experience. Designed and made in the USA, these engraved wooden ornaments even smell like the holiday season. Why it makes a great gift: Christmas trees love treehouses! These classic wooden ornaments look at home in any tree and feature two iconic treehouses of TreeHouse Point. 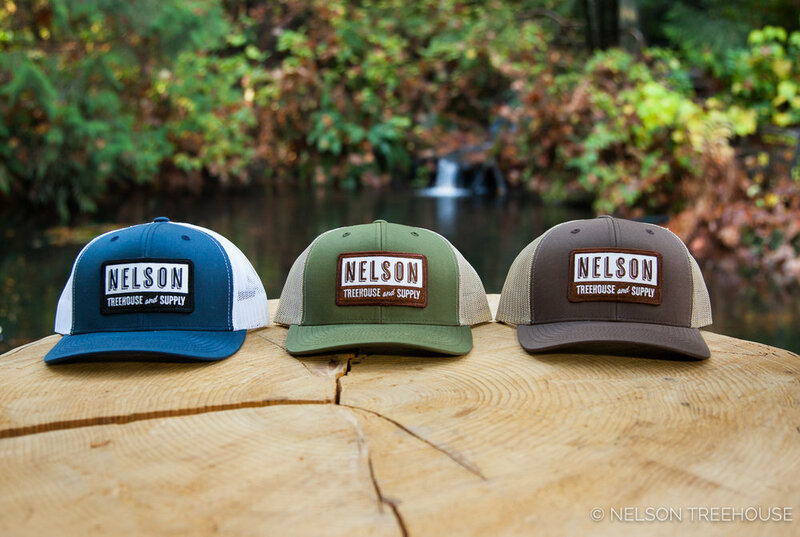 Our snapback hats were developed by the whole Nelson Treehouse crew. They were looking for a retro trucker hat with a mesh back - perfect for any type of weather while building outside. We also designed our patches in-house! Why it makes a great gift: With a variety of colors and patch styles to choose from, you'll find the perfect snapback for your treehouse aficionado. It's comfy, sturdy, and distinctive - the ideal snapback! Our heavyweight, chunky rib knit beanies have a traditional look and are always cold-weather-ready. Why it makes a great gift: Simple but super cozy, these beanies are key to happiness (and warmth) up in the trees on a chilly day. These vibrant concert-style posters feature iconic treehouses of TreeHouse Point. Why it makes a great gift: Each of these posters is designed by artist Tim Kelly and screen-printed by hand in the USA. With only 200 copies of each style, these posters make for a distinctive, handcrafted gift. Pete's books take readers to the trees, providing a comprehensive source of inspiration and practical information about treehouse design and construction. Why it makes a great gift: Treehouse DIY-ers and dreamers alike find inspiration in Pete's captivating photos and detailed descriptions. 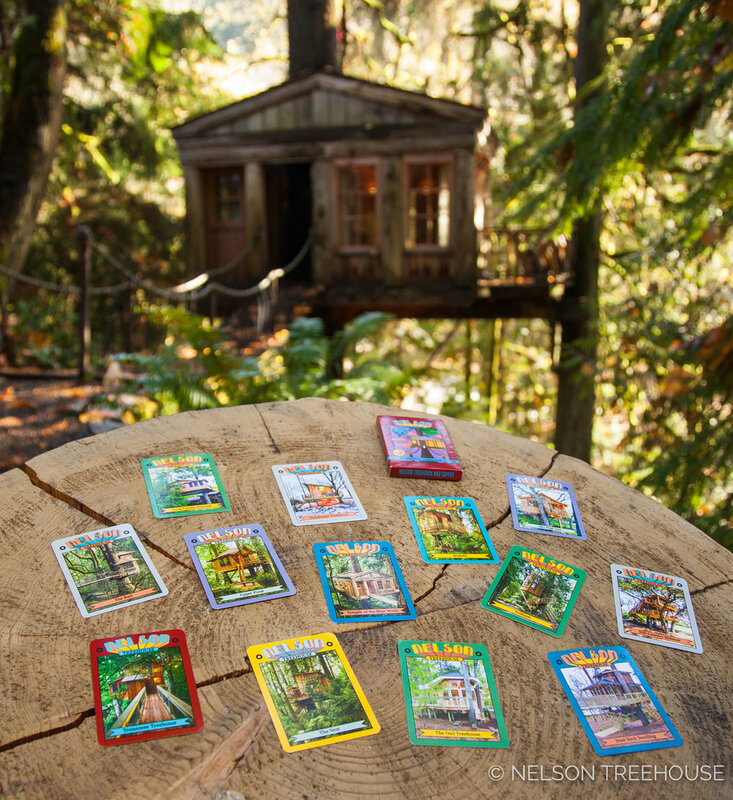 Each card features one of Pete’s legendary treehouses complete with fascinating facts and essential stats. Every pack comes in a glossy keepsake box and contains 12 unique treehouse cards plus one free gift! Why it makes a great gift: These throwback trading cards are the perfect stocking stuffer and also kind of addictive: they're educational, fun, and oh-so shiny! With spring blooming around us, the time is ripe to reach out to you all and share some important updates. 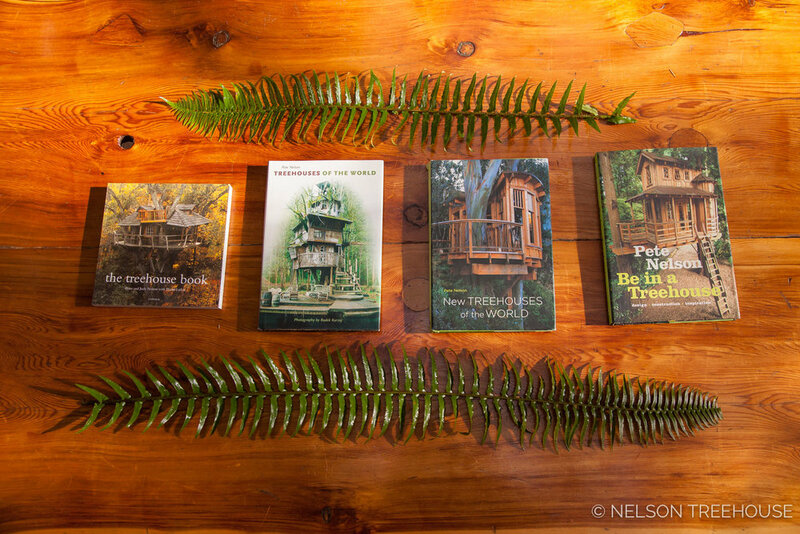 All the places you can go to visit a Nelson treehouse! One of the questions we’re asked most frequently is: ”Can I visit one of your treehouses?” The short answer is: Yes! Read on for a list of our treehouses that offer the opportunity for public visits, organized by type of experience. It goes without saying that every treehouse needs windows—one of the best parts of treehouses is that they provide an unparalleled view of the nature around them. But only some windows are designed to meet the unique demands of building up in the trees. Learn why we choose to partner with Marvin for our builds across the country.